The Arizona Coyotes intend to keep standout rookie defenseman Jakob Chychrun past the 9-game mark. The Arizona Coyotes are 3-6 to start the season. They haven’t had a lot to hang their hats on. One of the few bright spots has been 16th overall pick Jakob Chychrun. Chychrun was the 5th defenseman chosen in the 2016 NHL draft and most gave him little chance of making the NHL club in his first training camp. I hope no one bet on that. From rookie camp to training camp, Chychrun put on a tour de force showcasing his defensive promise and already considerable offensive instincts. In multiple interviews he expressed his determination to make the team. He also expressed confidence that he was skilled enough and ready for the show. On Wednesday, the team quietly agreed. There won’t be a big announcement from the Coyotes but D Jakob Chychrun is going to stay past the 9-game trial for junior-eligible players. Jakob Chychrun will remain with the team past the 9-game mark dictated by the CHL-NHL agreement. It’s hardly a guarantee that he will continue to be as effective as he’s been in his first 8 games, or that he will receive the kind of ice time he’s earned recently. For a kid who fell from the 2nd ranked skater in the 2016 draft to the 16th overall pick, it has to feel like vindication. When told about the news, Chychrun seemed thrilled. And just like that, Jakob Chychrun became the only defenseman picked in the first round of this year’s draft to remain on an NHL roster. Three of the names chosen before him didn’t even get a game in. The fourth, Mikhail Sergachev, averaged 10:26 minutes of time on ice and skated in three games. The Montreal Canadiens have already sent him back to juniors. 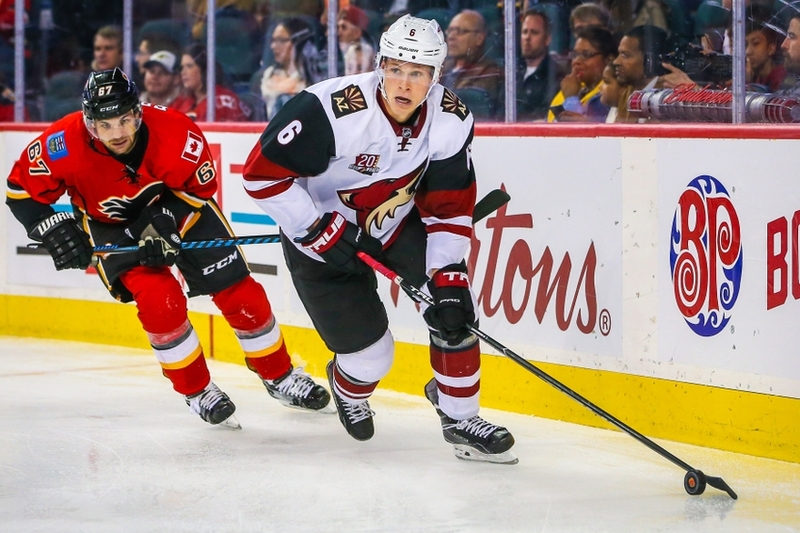 Jakob Chychrun has earned the respect of Arizona Coyotes management with his performance. He’s earned the respect of his team with his work ethic. The fans are already in love and a few Chychrun #6 jerseys have begun showing up at Gila River Arena. This is a big moment for the 18-year-old from Florida. His progression thus far may prove even bigger to the future of the Arizona Coyotes.